These are five words familiar to anyone who has attempted to caulk a wagon and ford rivers en route to the Willamette Valley. 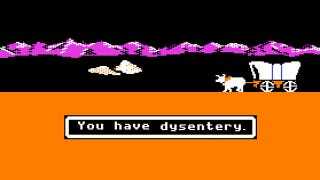 Oregon Trail not only taught generations of kids about Western migration in 19th-century America, it also familiarized them with various strange-sounding diseases. Let's catch up with some of those diseases and find out if they're just as nasty today. Then: The number one killer of the actual Oregon Trail, cholera is an infection of the intestines caused by ingesting the bacteria Vibrio cholerae. Spread through contaminated food or water, cholera released an enterotoxin that effectively flooded the intestines with excess water. This led to continual watery diarrhea, causing severe dehydration and often death. The worst outbreaks occurred on the Oregon Trail in 1849, 1850 and 1852. The only available treatment in the game was a medicine known as laudanum-understood today to be pure opium. Now: According to the Centers for Disease Control, cholera remains a global pandemic. Though there is still no vaccine for the disease (in the U.S.), it can be treated with a regiment of fluids and electrolytes, as well as antibiotics. The best defense remains stringent sanitation regulations, a luxury afforded primarily to industrialized countries. The World Health Organization has recorded recent outbreaks in Democratic Republic of Congo (July 2011), Haiti (November 2010, October 2010), Pakistan (October 2010) and a severe outbreak in Zimbabwe (June 2009, March 2009, February 2009, January 2009, December 2008). Then: Caused by Corynebacterium diphtheriae, diphtheria is an airborne bacterial disease. It usually showed up first in the nose and throat, but could also surface as skin lesions. A gray, fibrous material would grow over airways, causing difficulty breathing and sometimes uncontrollable drooling, as well as a deep cough and chills. Diphtheria was most common on the trail during the winter months. Now: Routine childhood immunizations have nearly erased diphtheria in the US. According to the US National Library of Medicine, there are less than five cases here a year. Though it is still a problem in crowded nations with poor hygiene, diphtheria is now rarely fatal. • 22 Fictional Characters Whose Names You Don't Know "Did you know the Comic Book Guy on The Simpsons has a name? It's Jeff Albertson. But that wasn't the decision of creator Matt Groening." • The Wet and Wild History of the Super Soaker "In 1982, NASA engineer and spare-time inventor Lonnie Johnson was working on his latest creation - a cooling pump that used water instead of Freon. He had a custom nozzle hooked up to his bathroom sink, and when he turned the water on, it fired a stream across the room. He immediately thought, "This would make a great water gun!" • 17 Vowel-Free Words Acceptable in ‘Words With Friends' "BRRR.PFFT. PSST. TSKS"
Then: Dysentery, aka shigellosis, was not as widespread on the trails as its peer cholera. During the 19th century, dysentery was a bigger problem on the Civil War battlefields. Like cholera, dysentery spread via contaminated water and food, thriving in hot and humid weather. Unlike cholera, dysentery lived in the colon and caused bloody, loose excrement. The rise of dysentery in the 1800s was partially due to infected warm cow's milk, an ideal incubator for shigellosis. Now: Dysentery is still a major threat to the developing world. Not only is there no effective vaccine, recent strains are increasingly resistant to antibiotics-the only proven line of defense in tandem with fluids. It is estimated by the WHO that 80 million people contract dysentery annually. An outbreak was detected in Japan this past August. Then: Evolved from the rinderpest virus, the highly contagious measles ravaged the United States in the 19th century. It was not measles, but complications like bronchitis and pneumonia that made it life threatening. Measles was spread through contaminated droplets-coughing, sneezing, wiping one's nose and then touching anything. It caused nasty rashes, fever and conjunctivitis. Now: A vaccine was discovered in the mid-20th century, virtually eradicating measles from the developed world. It is now part of the trifecta inoculation MMR (Measles-Mumps-Rubella) most American children receive in infancy and again at age 6. Though relatively contained, measles is still endemic. In 2009, there was an outbreak in Johannesburg and other parts of South Africa. New Zealand saw a small spike in August 2011, with nearly 100 cases popping up in Auckland. Then: Unfamiliar with the virtues of boiling water first, Oregon Trail pioneers contracted typhoid like many other diseases-from contaminated water. Caused by Salmonella Typhi, Typhoid was spread when an infected person "shed" the bacteria. Sparing you the grisly details, let's just say the bacteria lived in a person's blood and intestines. The major symptom was high fever, followed by weakness and loss of appetite. In the warmer months, typhoid was a real killer. Now: Still a killer, though not in the Western world. The CDC says it's preventable with good sanitation and antibiotics, but even Westerners are not immune when traveling in developing countries. The CDC strongly recommends anyone planning travel to a ‘non-industrialized' nation get vaccinated-and avoid any tap water or food cooked in unclean water. Laura Turner Garrison is a writer at Mental_Floss, where knowledge junkies get their fix.